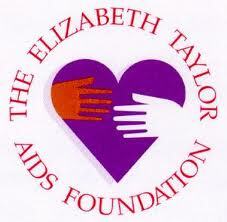 Having suffered ill health for some time, former screen goddess Dame Elizabeth Taylor died last week, aged 79. Born in London in 1932 (of American parents), Taylor was a true Hollywood icon, a legendary violet-eyed beauty who was also a fine actress. Having become a child star, due to her appearances in ‘Lassie Come Home’ (1943) and the following year’s ‘National Velvet’ (her co-stars being a dog and a horse respectively), her reputation was further enhanced via roles in films including ‘Little Women’ (1949), ‘Father Of The Bride’ (1950), ‘A Place In The Sun’ (1951) and ‘Giant’ (1956), where she appeared alongside James Dean and Rock Hudson. Her career really went into overdrive during the late ’50s when she was nominated for the Best Actress Oscars for ‘Raintree County’ (1957), ‘Cat On A Hot Tin Roof’ (1958) and ‘Suddenly, Last Summer’ (1959). A fourth consecutive nomination followed in 1960, but this time she finally picked up the Academy Award for ‘BUtterfield 8’, and would claim her second Oscar later in the decade for her memorable role in the emotionally charged ‘Who’s Afraid Of Virginia Wolf’ (1966), the film she said she was most proud of, playing opposite her then husband, and love of her life, Richard Burton (who she’d first starred with in 1963’s ‘Cleopatra’, for which she became the highest paid actress in history up to that point, securing a million dollar deal). “unquestionably gorgeous. I can think of no other word to describe a combination of plentitude, frugality, abundance, tightness. She was lavish. She was a dark unyielding largesse. She was, in short, too bloody much”. 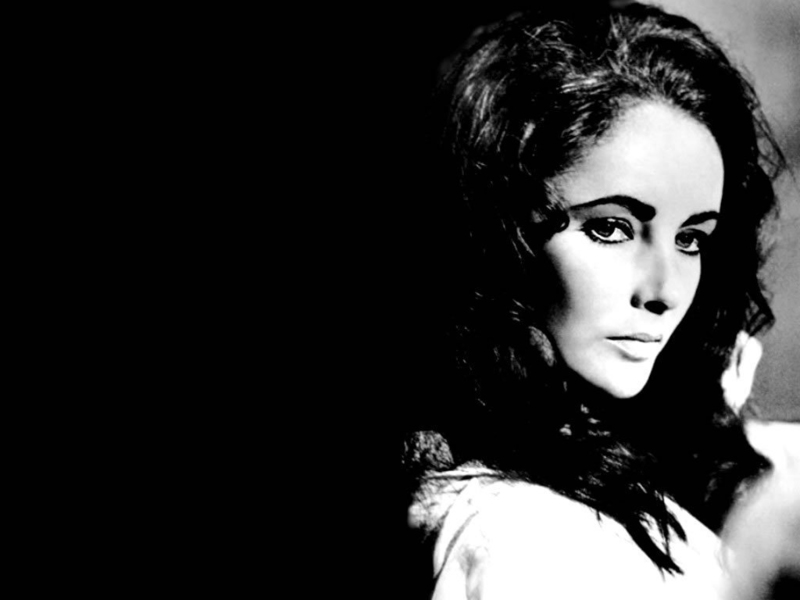 Her star gradually dimmed following its mid-’60s peak, but her status as a Hollywood icon burnt brightly throughout her lifetime – there was always an aura that surrounded Liz Taylor, and she made full use of this to further the causes closest to her heart. She championed HIV / AIDS awareness at a time when most celebrities distanced themselves from any association with what was initially regarded by many as a ‘gay plague’. Following the AIDS related death of friend and ‘Giant’ co-star, Rock Hudson, in 1985, she co-founded the American Foundation for AIDS Research, and over the years she’s said to have raised in excess of $100,000,000 to fight the disease, helping to make it a mainstream concern in the process. Remembered by many more for her multitude of marriages (eight in all, to seven different husbands) than her film roles, and known to a younger generation via her long friendship with Michael Jackson, Taylor combined the two when she married construction worker Larry Fortensky at Jackson’s Neverland Ranch in 1991. 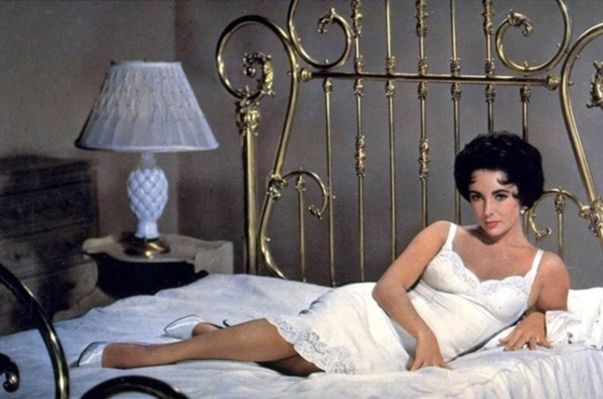 ‘Cat On A Hot Tin Roof’ is the movie that always springs to mind whenever I think of Elizabeth Taylor, conjuring the image of her resplendent in white slip as the feisty Southern belle Maggie The Cat. This big-screen adaptation of the classic Tennessee Williams Pulitzer Prize winning play, which co-stars Paul Newman, as Maggie’s husband, Brick, and Burl Ives as his father, the family patriarch Big Daddy, provided Taylor with one of her most celebrated roles, although Williams himself expressed disappointment with the way the film had watered down the play’s critique of homosexuality and sexism. With Hollywood’s golden age an ever distant memory, Taylor joins the pantheon of late great stars whose performances are thankfully preserved on celluloid (or digital in this day and age) for future generations to enjoy. But it was her humanitarian work with HIV / AIDS sufferers that she believed to be her greatest legacy, and something that will continue to be of major benefit for many people long after her passing. the first two stars i followed. i loved their love and romance. My fav film with them both in was Taming of the Shrew, just brilliant.